Novi proizvod: GIVI V37 bočni koferi - uskoro u prodaji! Najnoviji GIVI proizvod su novi V37 bočni koferi, evolucija poznatog V35. When considering an accessory for your motorcycle, do you continually ask yourself whether or not it will complement the aesthetics of your two wheels while guaranteeing maximum comfort? GIVI motorcycle accessories have always been the solution and, in fact, like all the accessories produced by the brand, the new V37 motorcycle side-case has been designed to the highest detail, respecting compact yet elegant style without sacrificing practicality. The new motorcycle side-case features an innovative design along with a distinctive appearance. The central area is characterized by an insert resembling an arrow. 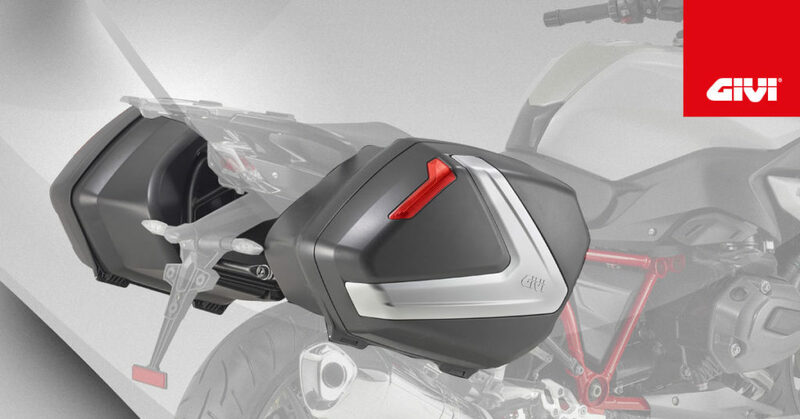 The case, sold in pairs, is available in two versions; either (painted) opaque silver or with a “carbon-like” finish, an appealing aerodynamic element able to distinguish this GIVI branded motorcycle accessory from all the others in circulation! Particular attention is also placed on safety; in fact this GIVI case is equipped with the Security Lock system and the lock barrels in a pair of V37 cases can be matched to other products within the GIVI range which are supplied with a Security Lock as standard. Finally, the 4-point MONOKEY SIDE fastening system, adopted on the V37 case, is designed to be compatible with all GIVI PLX and PLXR fastening systems. The new V37 motorcycle side-case, sold in pairs, is the brilliant new partner for all your future two-wheel journeys!